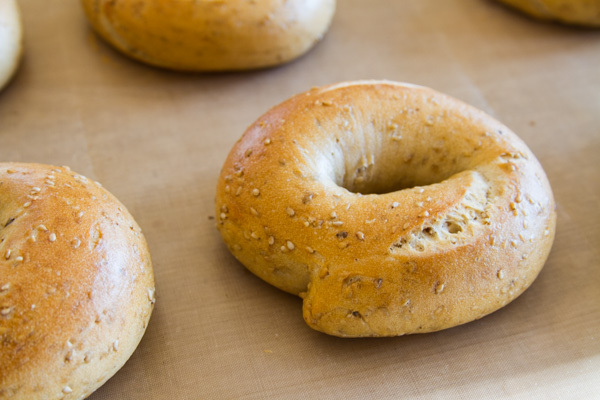 If you think these don’t look like the sesame bagels you’re used to seeing, you’re right. We love sesame bagels, but seed loss was putting us at risk for sprouting a sesame plantation right on the dining room rug. Although it is a unique and lovely look, we decided this wasn’t quite the decorating direction we wanted to be taking. The solution turned out to be simple: sesame seeds in the dough rather than on top of it. If you want to make a generic dough for several different toppings, this isn’t the way to go (try these bagels instead). But if you’re willing to commit to your sesame seeds, it works well. 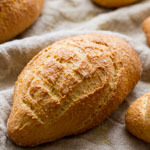 For maximally chewy bagels, remember to use high-gluten flour (or add extra gluten to your regular bread flour) and mix the dough until it’s very strong! Add the toasted, cooled sesame seeds to the dough once it’s fully mixed. In a dry skillet over medium-high heat, toast the sesame seeds, stirring constantly, until they pop. 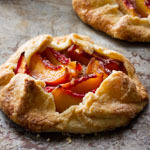 Immediately spread them on a cold baking sheet and refrigerate until cooled. Combine the starter, water, flour, gluten, malt, milk powder, and salt in the bowl of a stand mixer. Mix on low speed to combine. Mix on medium-low speed for another two or three minutes, until the dough is very smooth and strong, almost rubbery. Add the sesame seeds and mix until they are evenly distributed in the dough. 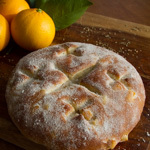 Turn the dough out onto an unfloured counter and work a few turns by hand. Form the dough into a smooth ball; the surface should feel satiny and tight. Cover the dough loosely with plastic wrap or a towel and let it rest for 10 minutes. 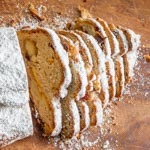 Divide the dough into 12 pieces of about 100 grams each. Flatten each piece and roll it up into a tight cylinder. Let the cylinders rest, covered, for 10 minutes. Meanwhile, line a baking sheet with parchment paper and dust it generously with semolina (or use reusable parchment with no semolina). 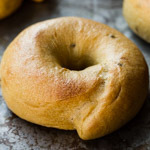 Place the bagels on the prepared baking sheets, and slip into a large food-grade plastic bag or cover with plastic wrap. Proof for 1 – 3 hours at room temperature, until the bagels look and feel a bit puffy. Then refrigerate them for 4 – 8 hours. Meanwhile, preheat the oven to 425F and put a large pot of water on to boil. When the water is almost boiling, place a cooling rack on the counter with a dishtowel underneath it. Remove the bagels from the refrigerator, brush the semolina off their bottoms, and place them on the cooling rack. When the water has reached a rolling boil, add the baking soda. 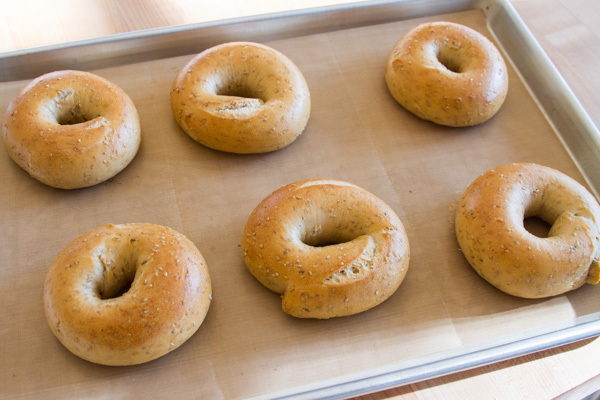 Drop the bagels, three or four at a time, into the vigorously boiling water for 20 seconds. They may or may not float right away, but they should float by the time the 20 seconds are up. If they float right away so the tops are not submerged initially, flip them over about halfway through the boil. Remove the bagels from the water to the cooling rack with a slotted spatula. Let them drain for about 30 seconds before replacing them back onto the semolina-dusted, parchment-lined cookie sheet. Turn the oven down to 400F once the bagels are in. Bake until golden brown, about 20 – 24 minutes. About halfway through baking, open the oven door briefly to vent any steam. Earlier this week I made your sourdough bagel recipe and put toasted sesames in them. I also added about 30% whole wheat flour. Thanks for such yummy bagels! These look fabulous! Good bagels are so difficult to find in my city, that I think I might just have to try this. I have been making your bagel at a regular basis now. I can not thank you enough. Bagels look good. Just perfect. I have many failed attempts at bagel making. This reminds me, I need to try them once again. These look lovely! 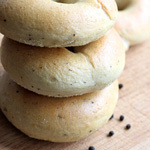 I’ve been meaning to try some of your bagel recipes lately… these will be the ones! 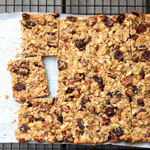 Commit to sesame … that really shouldn’t be difficult! Love that image: sesame plantation right on the dining room rug. Susan, these are on my list to try real soon. We have some excellent bagel shops where I live so I usually don’t bother making my own, but I have been meaning to try some sourdough ones so thanks for the recipe. Fantastically looking bagels. I’m so happy to try these, as the sourdough bagel is a dream come true for me. Thank you, Susan, you inspire to no end! they look wonderful. I love the idea of having the seeds in the dough.